We updated our list of best scuba diving lights on the market in 2019. How to choose a dive light? Casing and Size: Portable/handheld or canister? Lighting System: Traditional bulb, LED or HID? ​Sealing Mechanism: O-ring or totally sealed? 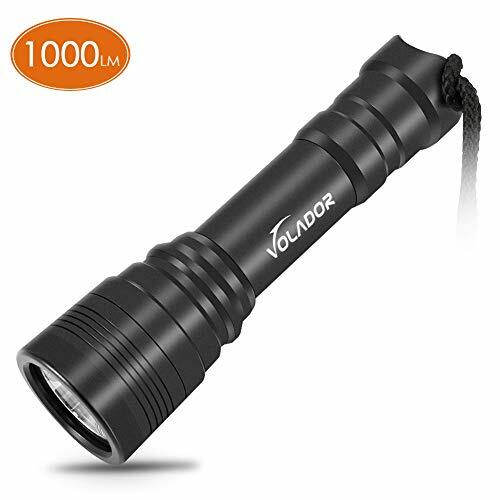 With a length of only 14.6 centimeters (5.7 inches), head diameter of 4.1 centimeters (1.6 inches), tail diameter of 3.1 centimeters (1.2 inches) and weighing only 180 grams (6.3 ounces), the Volador Diving Flashlight is one of smallest and compact dive light available in the market. The lighting system involves a high quality XM-L2 LED light that has a maximum output brightness of up to 1,000 lumens and has a 50,000 hours lifespan. It is powered by a single 18650 battery which is a type of rechargeable cell made of Lithium Ion that has a 3.7 volts output and a capacity range from 1,800 to 3,500 mAH. The battery comes with its own battery charging compartments that can be recharged using powerbank, USB toggle to a computer or your typical wall charger. Side note: Do you know what the numbers stands for in the 18650 battery? Just like in other batteries like AAA, D or AA batteries, the numbers stands for the size. In this case, it pinpoints to its exact dimension where a 18650 battery has a diameter of 18 millimeters and a length of 65 millimeters. The Volador Diving Flashlight is encased in an aircraft grade AL-6061-T6 aluminum that has passed military regulations III that is further polished with a hard-anodized finish making the entire unit abrasion and corrosion resistant. The sealing mechanism involves 3 o-rings embedded and installed at the tail opening. It has earned an IP68 waterproof certification which means that the unit can be operated up to 150 meters (492 feet) deep. The entire package includes 1 diving flashlight, 1 battery cell charger and cable, 1 lanyard, 3 o-rings and 1 user manual. After opening, attach the lanyard to the lanyard hole located at the tail end of the flashlight. Press the magnetic switch located at the tail end, where by pressing the button for 2 to 3 seconds, will shift to different lighting modes, namely: high, medium, low and strobe mode. It is recommended that you fully drain the battery to allow a first full charging to occur. Once the battery is drained, open the tail cap by twisting until it is fully detached. Remove the battery and place it to its provided charging compartment. Once plugged in, the battery compartment has a light indicator where red indicates that the battery is charging while green indicates that the battery is already fully charged. While waiting for the battery to be fully charged, you can now attach the 3 o-rings in their respective depression rings at the base of the tail end. You can lubricate the o-ring with silicone grease. Once the battery is fully charged, place them back inside the flashlight and secure back the tail cap by twisting it in a clockwise direction. Once everything is attached and in place, you can now turn on the unit and start with your diving adventures where you will be surprise to see the brightness of this unit as it produces a super bright white light underwater that can be clearly seen up to a distance of 80 meters (262 feet). Soak or rinse in freshwater after every use. Having a dimension of only 15.2 centimeters (6 inches) in length and a diameter of only 3.8 centimetres (1.5 inch), the OxyLED 1100 Lumen Diving Flashlight is considered a pocket dive light that has one of the brightest illuminations. Using a single CREE LED manufactured by America’s leading manufacturer of innovative semiconductor products, this dive light can produce a brightness of 1,100 lumens and has a lifespan of 50,000 hours. 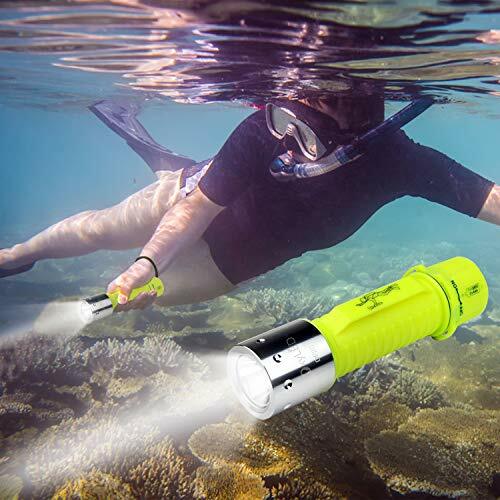 Aside from scuba diving, this dive light can also be used during camping, hiking, snorkeling, boating and other outdoor sports making this dive light highly versatile. But its versatility is not limited to its usage where it is extended to its battery compatibility. 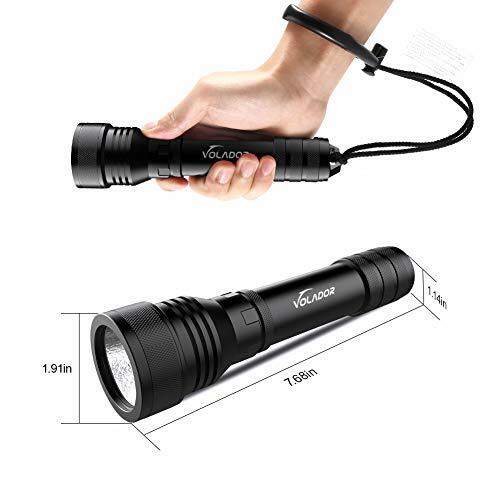 While the OxyLED 1100 Lumen Diving Flashlight is primarily powered by a single 18650 Lithium ion rechargeable battery, it can also be powered with 3pcs AAA battery. This feature alone gives you the capability for an unlimited use of the unit. When it comes to waterproof capability, this dive light is encased in durable plastic tube and sealed using 3 o-rings. It has earned an IPX8 rating where it can be submerged up to 24 meters (80 feet). 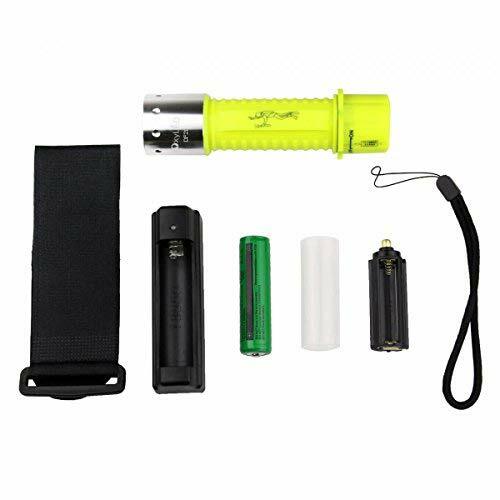 The entire package includes 1 dive flashlight, 1 lithium ion battery, 1 battery charger compartment, 1 white tube to hold the 18650 battery, 1 battery holder for the AAA battery (AAA battery not included), 1 velcro wristband, 1 lanyard, 1 storage box and user manual. After unboxing, you can attach the velcro straps at the provided attachment in the central part of the plastic tubular case while the lanyard can be secured at the lanyard hole located at the base of the tail cap. Opening the tail cap allows you to see the battery compartment where you can have the option to use the provided 18650 Lithium Ion Battery or 3pcs AAA battery. The only difference between using the 2 battery system is that you need to place the Lithium Ion Battery inside the white tube while you need insert the 3pcs AAA battery inside a separate compartment that fits inside the plastic tube. Once you place the battery, you can place back the tail cap by twisting it until the end which automatically sets the light to full on mode. There are 3 light modes available in the OxyLED 1100 Lumen Diving Flashlight, namely: high, low and strobe mode. But you have to remember that this dive light has no magnetic switch. Instead, you need to slightly twist the tail cap for it to switch to other light modes. A fully charged battery allows this dive light to continuously lit for 2 hours on a high mode and 5 hours on a low or strobe mode. Do not forget to lubricate the o-rings before use and rinse or soak the unit in freshwater every after use. 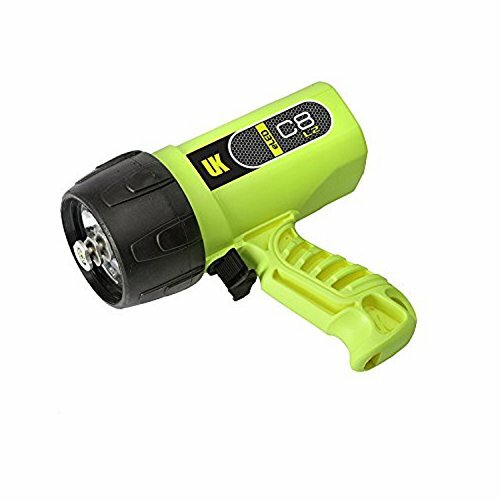 Considered as mid-sized portable and compact dive light, the Volador Scuba Diving Flashlight has a dimension of 19.5 centimeters (7.68 inches) long and 5 centimeters (2 inches) in diameter. It is equipped with the XPH50 CREE LED bulb that has the capability to produce a brightness of up to 2,000 lumens and has an operating lifespan of up to 50,000 hours. The unit is powered by 2 pieces 18650 lithium ion rechargeable batteries where a fully charged battery can continuously lit up the unit for 1 hour. The Volador Scuba Diving Flashlight has a tubular body made out of a solid construction that is composed of AL-6061-T6 which is classified as a military grade aviation aluminum making this dive light abrasion and corrosion resistant. Its internal structure is made out of a double barrel body which acts a mechanism against overheat and external electrification. It has employed a sealing mechanism that involves 3 o-rings located and embedded at the mid-portion of the body. This dive light has an IP68 waterproof rating where the unit can be submerged up to a depth of 150 meters (492 feet). But this does not mean that you are diving at that depth as we are restricted on our level of scuba certification where the maximum depth set for recreational scuba diving is 42 meters (140 feet). The entire package includes 1 diving flashlight, 2 pieces 18650 lithium ion rechargeable batteries, 1 battery charger, 3 pieces rubber o-rings, 1 lanyard and user manual. Once you unbox and check the parts, you can now attach the lanyard to the lanyard hole located at the base of the body. In most instances, the battery is not yet installed. So you need to open the dive light in order to insert the batteries. To do this, you need to hold and grip the body with two hands and twist it at the center in a counter-clockwise direction. Do this until the tail cap is totally dislodged. Once open, insert the 2 pcs lithium ion battery one after the other and in such a way that they are positioned on the correct polarity. After placing the battery, you can place back the tail cap by twisting the body in a clockwise rotation. Do this until you reach the end of the notch where the flashlight automatically turns on. You also have to take note that this dive light has a rotary switch, that with a little back twist, turns the light off. Underwater, this dive light will produce a super bright neutral white beam that can be clearly seen up to 236 meters (774 feet) away. When the batteries are drained, you can take it off from the unit and recharge it using its provided charger. A single charge may take up to 4 to 5 hours before it reaches full capacity as indicated by a green light. Soak and rinse the unit in freshwater every after use. 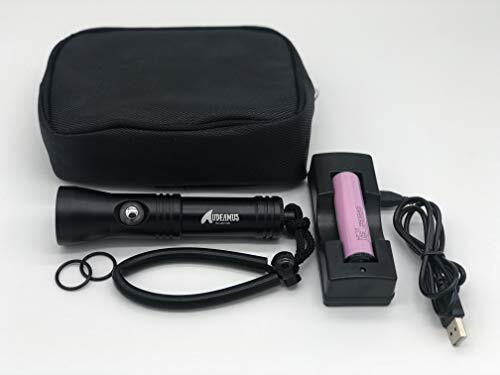 The Audeamus Rechargeable Waterproof LED Dive Light is one of the smallest and lightest compact dive light in the market that only measures 13.9 centimeters (5.5 inches) in length, 6.8 centimeters (2.7 inches) in diameter and 167 grams (5.9 ounces) in weight. But despite being small and lightweight, it is one of the brightest dive light that has the capacity to produce 1,200 lumens courtesy from its powerful LED bulb. This dive light is powered by a powerful battery - the Samsung 18650 Lithium ion rechargeable battery. The Audeamus Rechargeable Waterproof LED Dive Light has a sturdy yet lightweight casing made from a high grade aluminum alloy that is both abrasive and corrosive resistant. Its sealing mechanism employs 2 highly durable o-rings which makes this dive light waterproof and can be brought up to 100 meters (330 feet) deep. Its main switching mechanism is located at the central portion of the body, where a press of the button, allows you to go to different lighting modes, namely: high, medium, low and SOS otherwise known as the strobe mode. When fully lit on a high mode using a fully charged battery, this dive light can continuously lit up to 90 minutes. Included in this package is 1 dive light, 2 o-rings, 1 lanyard, 1 Samsung 18650 Lithium ion rechargeable battery, 1 battery charger with USB cable, 1 soft case and user manual. After unboxing, you can attach the lanyard to the lanyard hole located at the base of the tail cap. Open the dive light by twisting in a counterclockwise direction until the tail cap is fully dislodge. Lubricate the o-rings with silicon grease and place them in the o-ring depression located in the notch. Place the battery in such a way that the polarity is in their correct position. Place back the tail cap by twisting in a clockwise direction and do this until you reach the end of the notch. Switching the unit requires you to press the on/off button located at the base of the head cap. Each press of the button will lead you different lighting modes such low, medium, high and strobe mode. When the battery is discharged, take them out of the dive light and recharge them using the provided charger. Take note of the light indicator in the charger where red indicates charging while green indicates a fully charged battery. Note: the battery is sealed on each end with a grey sticker. Do not forget to remove the said sticker before placing them inside the dive light or charging for the first time. Otherwise, no electricity will flow through and the unit will not work. Instead of having a long tubular body like what previous dive lights feature, the Underwater Kinetics C8 Dive Light has an optical design with a slanting T-shape hand grip. Due to its size measuring 18 centimeters (7.1 inches) in length, 8.1 centimeters (3.2 inches) in diameter and weighing 1.1 kilograms (2.5 pounds), this lighting unit is considered as a primary dive light. The unit is illuminated using two high intensity LED bulb that can produce a brightness of up to 900 lumens. It has 2 battery configuration where the unit can either be powered through a rechargeable battery pack or using 8 pieces of the standard alkaline C-cell batteries. This dive light has a manual switch that features 2 light modes, namely: low or high. On a fully charged or fresh battery, the dive light can lit up to 5.8 hours on high mode while illuminating at 900 lumens or 20 hours on a low mode illuminating at 400 lumens. The Underwater Kinetics C8 Dive Light has a unique feature called the Lumen Booster. This is the protruding metal found outside the head lamp which primarily functions as a heat extraction mechanism for the LED which increases the bulb’s performance and efficiency. This also maximizes illumination and concentrates 89% of the beam at the center while only 11% is scattered as a perimeter beam. This light quality is very much appreciated if you are in to underwater photography as the effect of the central concentrated beam minimizes glare and backscatter. Before ordering and in case you decide to power up this dive light using a rechargeable battery pack, you have to include it in your order as the battery pack is sold separately. Once you have the unit, you can open the head cap by twisting it counter-clockwise. Do this until the head cap is fully detached. After detachment, you can now place the battery or the 8 pieces standard alkaline C-cell batteries. Just make sure you follow the directions in such a way that the batteries are placed in the correct polarity. After placing the battery, you can now place back the head cap by twisting it clockwise. Twist it until you reach the end of the notch. Switching the unit requires you to press sideways the manual switch button near the handle grip where you can choose between on, off, high and low mode. Before diving, do not forget to place a lanyard on the lanyard hole located at the base of the handle grip. The length of the lanyard will depend on where you will attach the dive light. A short lanyard is required if you plan to attach the dive light in your wrist while a longer lanyard is needed when you want to attach the unit to your BCD’s D-ring. Soak and rinse the unit in freshwater every after use. How to choose a Scuba diving light? There are 2 common types of dive lights according to usage: primary and secondary dive lights. Primary dive lights are your main underwater lighting system where the whole unit is encased in a sealed container with a handheld grip and a lanyard that can be secured on the wrist. Another type of primary dive lights are the canister type where they are considered as the wired version of the handheld lights wherein the battery is enclosed in a canister and connected to a head lamp through a sealed wire. On the other hand, secondary dive lights are portable, small, compact and tubular in shape. They are usually stored inside the BCD pocket or secured on the BCD strap using their own lanyard. All dive lights can be operated using either disposable or rechargeable batteries where each of the battery types has its own advantages and disadvantages. The good thing with using disposable batteries is that you can have the liberty to use the dive light anywhere you want and having spare batteries will give you an extended time of usage. However, dive lights operated using disposable batteries often has a low light emission. Dive lights operated using rechargeable batteries usually have a high light emission and can be operated for extended hours without the need for recharging. However, once the batteries are drained, you need an electrical connection for the battery charger to function and this is a big disadvantage when you go diving in remote areas that often doesn’t have electricity. Tip: If you are diving in remote areas without electricity, we highly suggest that you have a dive light that is operated using rechargeable batteries and another dive light that is operated using disposable batteries. With the dive lights operated using rechargeable batteries, make sure that you have fully charge the batteries and only use the unit when highly necessary like during underwater. For dive lights operated using disposable batteries, make sure you have spare batteries and use the unit while at surface or at the boat or as a backup lighting system when underwater. Old dive lights usually has the traditional light bulb and are operated with disposable batteries. New models has LED (Light Emitting Diode) which can be operated either by disposable or rechargeable batteries. LED dive lights have a higher lumen rating as compared to traditional bulbs. But if you want the highest lumen rating, you can opt for the HID (High Intensity Discharge) units that are exclusively powered by high performance rechargeable batteries. Sealing Mechanism: O-ring or totally sealed? The most common type of sealing mechanism for dive lights is the o-ring which prevents water from entering and flooding the unit. But you also have to take note that there are new dive lights that are totally sealed virtually sealing all its components for a lifetime. It is powered by rechargeable batteries and uses magnetic charging to fill-up a drained battery cell. BlueFire 1100 Lumen is the perfect primary or secondary light giving you 80 ft of light. Updated L2 led with 3 working, 2 brightness levels and strobe. Underwater Kinetics SL4 eLed L1 Dive light Thumb or finger index for easy use, durable and LED will last thousands of hours and can be used on land as well! Goldengulf XM-L2 100m waterproof diving light is great for diving with its compact size and durability. Has rechargeable batteries and 2 spare O rings just in case! Shoot Waterproof Diving Light Waterproof up to 30m and compatible with GoPro and lots of other brands to lighten up those pictures. Great for day or night and acts as a two in one light for your camera and your sight! ScubaPro Scuba Diving Nova 700 LED Light made of aluminum and durable! 230 lumens and 100,000 hours of life!